Am Seitenende kannst Du Deine Meinung zu Prayers for Bobby (En) von Leroy Aarons äußern! Bobby Griffith was an all-American boy …and he was gay. Faced with an irresolvable conflict-for both his family and his religion taught him that being gay was „wrong“-Bobby chose to take his own life. This novel, nominated for a 1996 Lambda Literary Award, is the story of the emotional journey that led Bobby to this tragic conclusion. But it is also the story of Bobby’s mother, a fearful churchgoer who first prayed that her son would be „healed,“ then anguished over his suicide, and ultimately transformed herself into a national crusader for gay and lesbian youth. 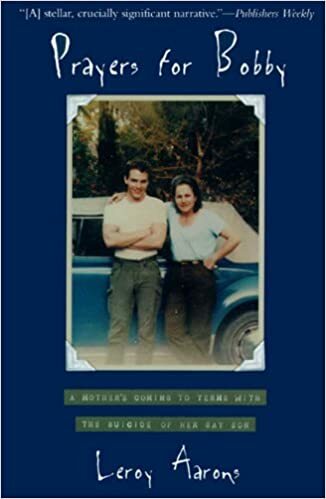 As told through Bobby’s poignant journal entries and his mother’s reminiscences, Prayers for Bobby is at once a moving personal story, a true profile in courage, and a call to arms to parents everywhere.